The book has 42 chapters, organized in an introduction and eight sections: academic essays, opinion columns, journalistic articles, short stories, life stories, poetry, theatre-script and interviews. It includes a prologue by Luz Bascuñán. 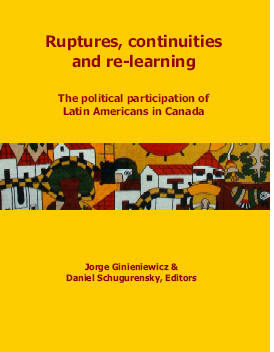 "The book ‘Fractures, continuities and re-learning: Civic and political participation of Latin Americans in Canada’ includes works that reflect a variety of experiences of Latin Americans who live in Canada, from the reasons why they had to leave their countries of origin to their activities in Canada today. In order to enhance the development of our community, it is imperative to obtain more information from ourselves. This type of work allows us to enrich our collective knowledge by sharing diverse experiences from different literary genres." "This book is the first of its kind for the Latin American-Canadian community and allows Latinos and Latinas wherever they live to know that there is something bigger than the little community that they see at the local community festivals." Please contact The Transformative Learning Centre at tlc@oise.utoronto.ca.